Every once in a while, along comes an athlete that defies the laws of nature. Common sense tells you that someone 5’8/ 185lbs can not physically play with “the big boys” in the NFL. DBs today are 6'2/215 lbs and run 4.4 40s. How can someone 5'8 compete? The last WR of that size that could and is familiar to Panther fans was that little guy out of Utah. Who, by the way, is our All-Time leading Receiver. I clearly recall when Panther fans were highly ticked off at then coach and GM, George Seifert for picking him. “How in the world do you waste a 3rd round pick on a 5’8 punt returner?" fans asked. I contend it could happen again. "He's too small for the NFL." His hands are only 8’ ¾ for crying out loud. (At least this is what I hope 31 teams in the NFL think about him). So does his size define him? One word answer is NO! A 5’8/ 185 lbs. the laws of nature will tell you he can’t do it; but Crowder just does it anyway. This backyard-baller from Monroe, NC (20 miles from where I grew up) is a play-maker waiting to explode on the NFL scene. Did you know that he is the All-Time ACC Receptions leader for both for a career and for a single season? He caught seven more receptions than Sammy Watkins did in his best year at Clemson. Did you know that he returned four punt returns for a touchdowns at Duke? And that you could expect the same in the NFL? What about those 8’¾ hands? Reports are that at his pro day, Crowder impressed scouts with his sure hands and he showed off by catching punts while holding two other footballs. I don’t think you have to worry about that. And what about that disappointing 40-time at the Combine? He made up for that at his recent pro day in Durham. Take a look at some of the reactions from his pro day. Jamison Crowder ran a 4.39 at his Pro Day, per @nfldraftscout. A much-needed improvement from his 4.56 at the Combine. Watch him as he turned in the 40 time that is probably worth about an extra $1M to this young man. Is He Steve Smith 2.0? 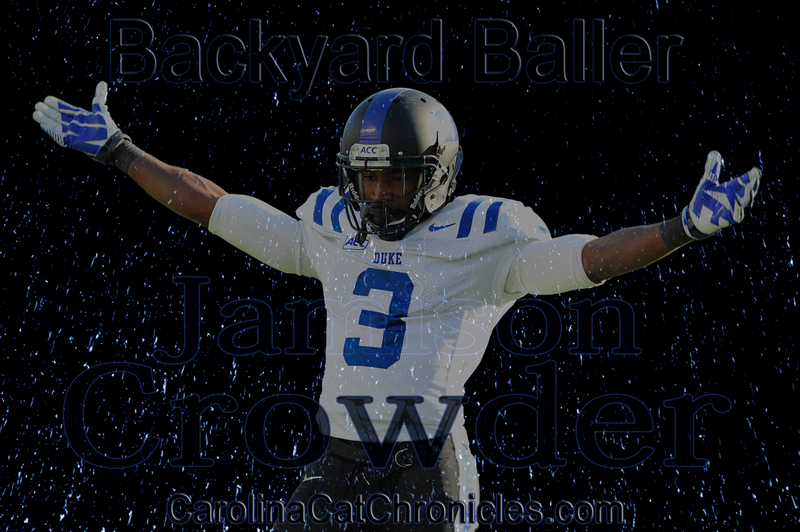 At the Duke pro day, his College QB, Anthony Boone, told reporters that Crowder has a little Steve Smith in him. That he plays with an edge about him, but that he is quiet and does not talk a lot. So maybe he’ll turn into an evolved Steve Smith. One that fits Carolina's locker room. But let’s face it, he has a long ways to go to be truly be able to be mentioned in the same category as Smitty. However, I do see him as a better prospect than 89 was coming out of Utah. The rest is up to Crowder and how good he wants to be. Maybe we can ask him that on the C3 podcast. Tune in to find out every Tuesday night at 10:00 EST at www.carolinacatchronicles.com. In summary, I really would love to see the Panthers nab Crowder and anywhere from the 3rd Rd on (though he is projected to go in the 5th most likely). Does anyone mind now that we took Steve Smith, Sr in the third round back in the day? I don’t think anyone would mind this pick after a few years either.